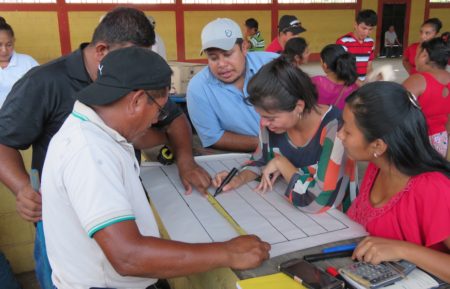 Bananera Nacional, S.A., BANASA, in alliance with the Association of the Trifinio Suroccidente (ASODITSO) and the Institute of Climate Change (ICC) in Guatemala, started this year a new Diploma of “Community adaptation to climate change”. This is the second diploma course that is carried out in the southwestern area in order to strengthen the capacities of communities to adapt to the impacts of climate change and to learn about the importance of good risk management in vulnerable areas. The diploma course began this month with the first module on integrated watershed management, with the specific topics of watershed diagnosis, its importance and methodology; how to develop a management plan for a basin; and definitions of climate change. Three sessions were held by the ICC, which consisted of face-to-face classes, workshops and practical activities. For this first module, a field trip was conducted through the upper, middle and lower part of the Ocosito River basin, with the aim of putting into practice what participants learned. More than 50 people are participating in the Diploma -BANASA workers, community leaders of 12 communities and Municipal Firemen. “We thank BANASA for the great support they are giving to the communities and for taking us into account in this Diploma,” said the participant of the Municipal Firemen of Coatepeque. The participating communities are San Luis, Pomal, Los Encuentros, Troje, San Rafel, Pacayá I, Valle Lirio, Colonia Diaz, Chiquirines, Carrizales, Morenas, Colonia Barillas and La Blanquita, from the municipalities of La Blanca, San Marcos; Coatepeque, Quetzaltenango and Retalhuleu, Retalhuleu.